From J.R. 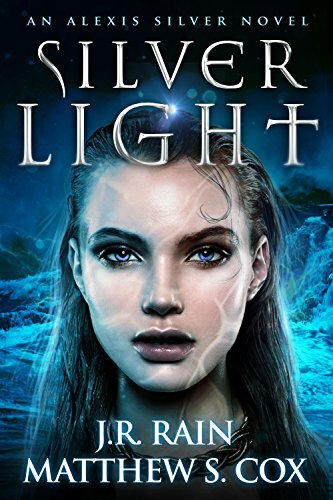 Rain and Matthew S. Cox, the bestselling duo that brought you New Moon Rising and Convergence, comes Silver Light, the first in a brand-new fantasy series starring Alexis Silver, mermaid detective! He had passed along the curse-or gift as Alexis sees it. J.R. Rain and Matthew S. Cox are doing a great writing, and their latest collaboration, Silver Light, is a testament to this. In it, they introduce us to another wonderful character, Alexis Silver, who became a mermaid when she drowned in the sea. And let me tell you, it’s not Ariel. With a resident Dark Master, razor-sharp teeth, iridescent scales and a penchant for eating hearts, she is a P.I. on the case of a missing family leading back to her beloved sea. She is truly a wonderful character, witty, down to earth and caring. And look and see, she was once “married” with Kingsley Fulcrum, our massive werewolf heartthrob from the Vampire for Hire series. The story comes to a very satisfactory conclusion without cliffhanger or teasing about what is to come. My only hope is that mr. Rain and Cox don’t make us wait too long after the next mystery. Highly recommended for everyone.